Gartner predicts that by 2020, a customer will manage 85% of the relationship with a business without interacting with humans and hence, the increased demand and adoption of self-help service. Chatbots can help customers with seemingly elementary tasks and act much quicker at times than humans. However, humans still have the ability to perceive and understand social hushed tones and subtext in a way that Chatbots cannot mimic. Contact centers have been positioned as the next phase of the chatbot roll-out revolution. Customer care representatives shouldn’t think about how to ignore the chatbot, but rather how to utilize its power for their good. Chatbots can be used to handle the initial interaction with customers in contact centers. Bots can take the customer details and information on the issue, before handing over to an agent. This reduces initial waiting time, meaning customers will already feel looked after and appreciated. 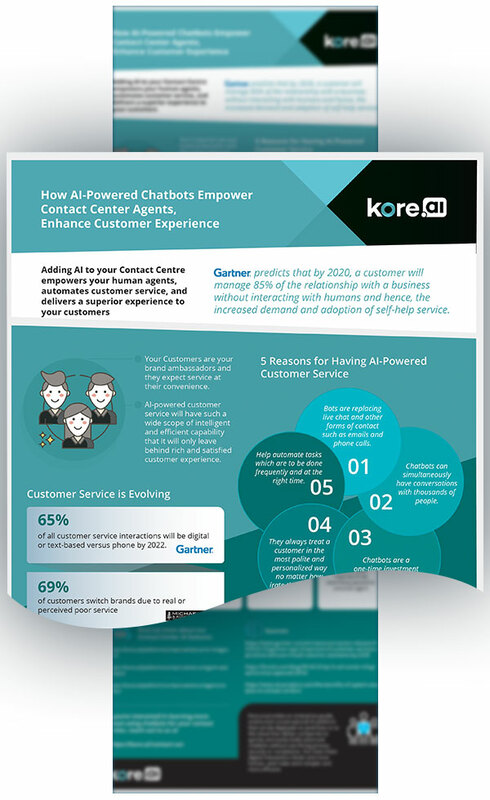 In this infographic, Kore.ai details the many ways chatbots can improve call experience for your customers by answering simple questions and routing issues - while simultaneously saving you and your team time and resources to work on higher-priority projects.